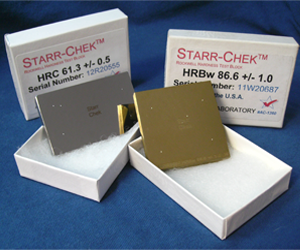 Starr-Chek Rockwell test blocks are calibrated in accordance with A.S.T.M. , ANSI and ISO/IEC, using NIST traceable reference standards. Starr-Chek Rockwell test blocks are held to a 30% tighter tolerance than is required by A.S.T.M. to provide our customers with the most accurate test blocks available. All blocks are supplied with a certificate that conforms to ACLASS ISO/IEC 17025 requirements. Starr-Chek Gridded Brinell test blocks are unique to the testing field. Gridded brinell blocks insure that the spacing requirements of ASTM are fully met. *Assuring conformity to ISO testing requirements. 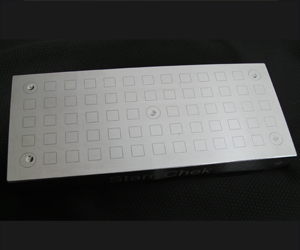 * Starr-Chek Brinell test blocks are calibrated in accordance with A.S.T.M. and are supplied with a certificate that conforms to ACLASS ISO/IEC 17025 requirements. For specific Hardness Test Blocks please call (651) 230-5978 for information.